Controls define how a player will interface with the experience that a game is trying to provide. If the controls are subpar, the experience will suffer. But sometimes, offering just different control mechanisms can change the experience in and of themselves, despite each being effective in different ways. 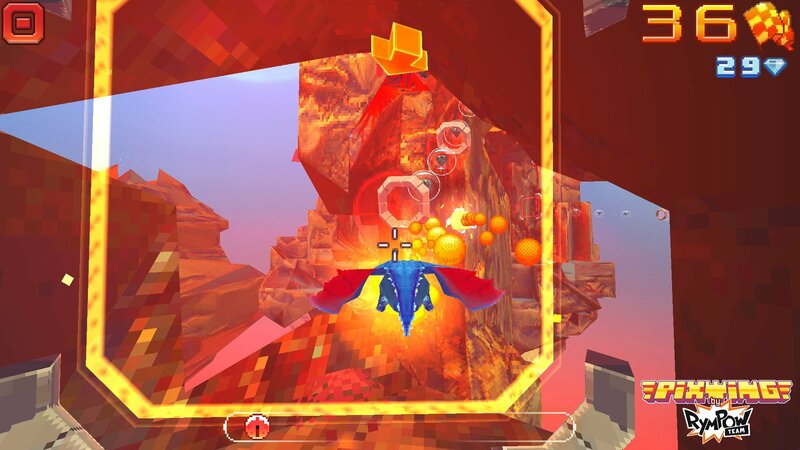 PixWing ($3.99) is one of those games, offering both a gyroscopic control scheme to fly around, but also a virtual joystick scheme. At first, the game made you at least play through the tutorial with the gyroscope, since the game is centered around moving your body to navigate the wolrd, offering the virtual joystick as an alternative. This reinforced the intended way to play the game, but it came with a drawback: if you tried playing the game in public for the first time, you were liable to look like a lunatic. But I understand why the choice was made, because the experience is so much immersive when you’re playing with the gyroscope versus the joystick. The game consists of three different worlds – rendered in a gorgeous style that resembles perhaps what a 3DS, or maybe a Dreamcast-era game would look like on a Retina Display? It’s a low-polygon look, but not quite what is considered low-polygon as a graphics style. It’s really interesting because it’s both inspired by earlier eras of gaming, but it’s its own thing entirely. These 3 worlds have 9 levels each to fly around in, with different checkpoints to fly through, and the occasional things to blow up along the way! 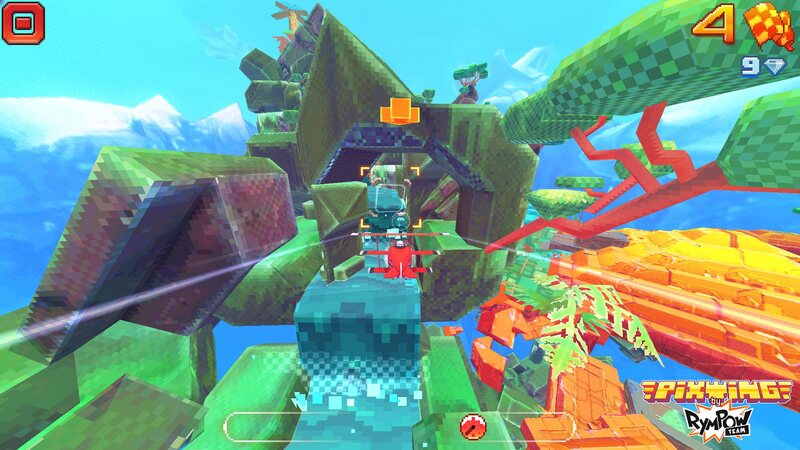 But the game also offers a free roam mode, which is fantastic because not only can you play it to just fly around and admire the creations, but there’s things to discover in the worlds, so there’s a point to playing them too! It’s double whammy enjoyment! You can earn money for finding secrets and for completing levels with different star ratings, and can unlock awesome new flying vehicles. Like, a dragon. I don’t care how awesome you think your plane of choice is, it pales in comparison to a frickin’ dragon. It’s also pretty powerful! But also, it’s a dragon! So, I have to say – if you can, play this game with the gyroscope. Play this game at home first. You need a bit of open space to play this, as you’ll be spinning around, trying to steer your aircraft through the friendly skies. It’s not going to be easy, necessarily, and you’ll have to make some dramatic and quick movements to pull off some of the hairier turns, but it’s really fun and immersive. Making those tough maneuvers is so much more satisfying when you’re actually physically doing something to accomplish them. And seeing the world move as you move gives it so much more depth, and a sensation that you’re actually there. The problem is that this means that you’re only playing the game in very limited circumstances of when you’re at home and in an area with enough space to move around and play the game, as otherwise, you pretty much can’t. This really uses the full 360 degrees of the gyroscope controls, it’s not just tilt controls. There’s a key difference. So, if you’re playing this game on the go, or while sitting down, then the virtual joystick is your way to go. It’s not that it doesn’t work well, because it does work well enough. You have the option to put it on either side, and play with small or large-sized joystick, and you can make subtle moves really easily. It’s a bit more of a challenge to make tough turns, but that just kind of simulates how hard they are with the gyroscope! You need to get used to how your craft handles, really. But the joystick experience is just subpar compared to what you know you have with the gyroscope controls. 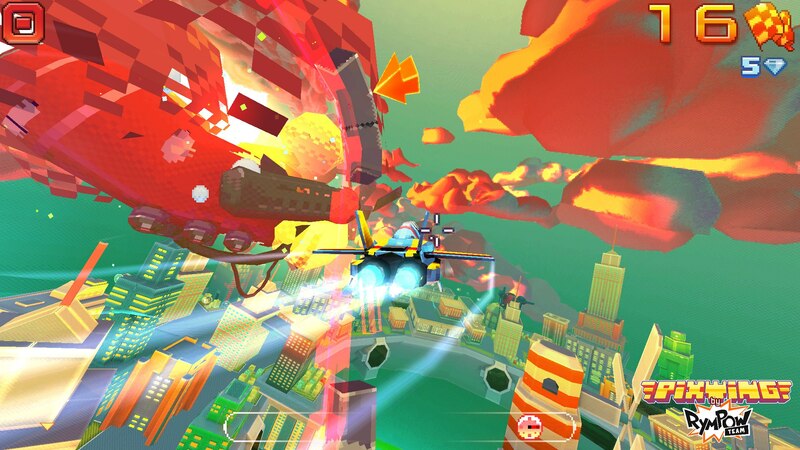 Having this really cool, colorful world that feels like you’re getting a window into it with the gyroscope controls just become another flying game while sitting down? Maybe it’s just that it feels deficient explicitly in comparison to the gyroscope controls, but I just don’t enjoy it as much. It’s still kind of satisfying to fly through all the gates, and to get three stars by nabbing all the gems and completing the levels in the prescribed amount of time. It’s tough to do, so it feels good to do that! But it just feels a bit more bland to play the game this way. I wonder how PixWing would be in VR. I would love to dive deep into the world and see it firsthand, and have it be all encompassing. The free roam modes are great for just looking around at the environments that have been created, but I would love being able to look around and experience them for myself. Maybe even Google Cardboard support someday? A pie in the sky dream, sure, but I want to play this game in VR somehow! PixWing is utterly gorgeous, and the production values are fantastic. Seriously, I fell in love with the look of this game from the first screenshot I saw, and the fact that you get to dig in and explore the world is an amazing experience. It’s just a game where you can only really enjoy it to its fullest potential in certain circumstances; and even then, it’s easy to imagine where it could be even better.